Take a stroll down memory lane with Emerson's NR305TT Heritage Series Home Stereo System. The NR305TT blends nostalgic styling with the latest features, giving you the best of both worlds. 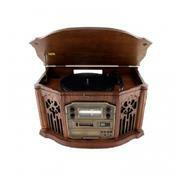 The beautiful high gloss wood veneer cabinetry offers a vintage look mimicking classic style vinyl record players. The 4-in-1 classic music player allows you to play your entire collection of vinyl records, CDs, tapes and even your favorite AM or FM radio stations. It features a ceramic jeweled stylus cartridge with rotary tuning and volume controls. You can easily locate your favorite track on a CD or radio station with the digital LED indicator. The 3-inch wide-range speakers offer crystal clear sound with the perfect balance of base. This stereo system is a work of art in sound, style, quality and image. The NR305TT is the perfect addition to any home and will bring back memories of the good ol' days of A-side tracks.